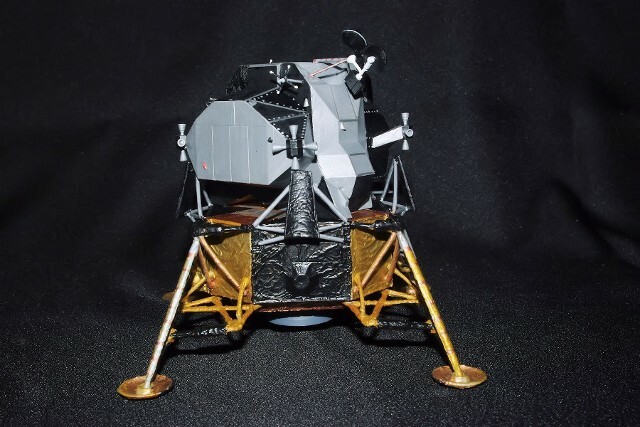 The kit is sold by Dragon as the "Apollo 11 - Eagle" Lunar Module. However, after four (maybe five) trips to KSC's Apollo-Saturn V Center in Florida, I've got a lot of pictures of a particular LM with a sorted history. LM 9 now hangs above the floor of the Apollo-Saturn V Center as a "working" memento to the time when America first went to the Moon. 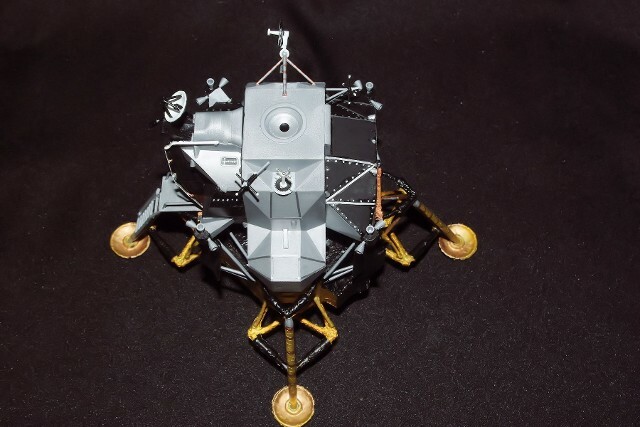 She is an actual, "flight rated" Grumman Lunar Module, originally intended for the Apollo 15 mission. 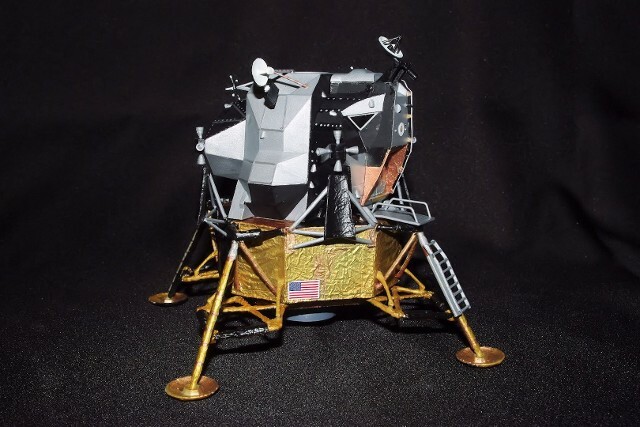 She is an "H Series" LM, built for shorter duration stays, such as Apollo 11 through 14. 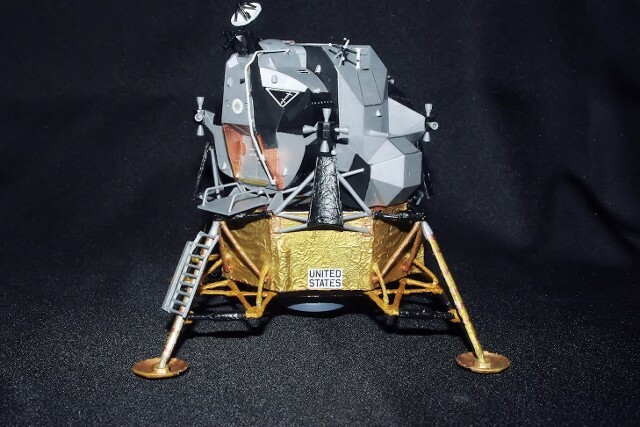 With the US Congress cutting back NASA's operational budget and eliminating Apollo 18, 19 and 20, NASA needed to shift hardware so that more lunar science oriented missions were placed sooner into the flow. 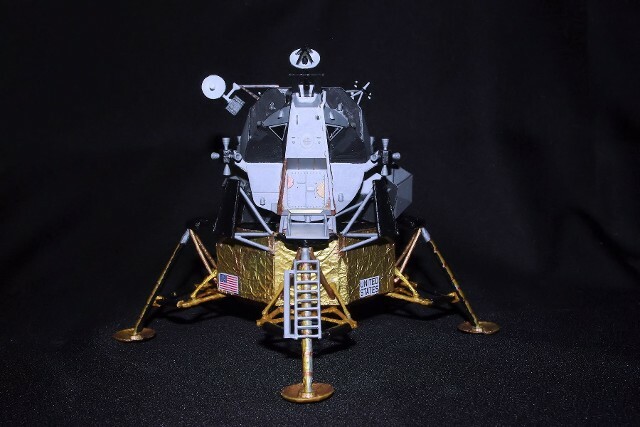 Therefore, LM 9 was replaced for LM 10 for the Apollo 15 mission, so that the J Series LM, with more consumables, bigger MESA, bigger ALSEP experiment storage and the Lunar Rover, would allow 15 to start the serious lunar exploration before the end of the program. LM 9 still remains, as does LM 2, which sits in the Smithsonian's National Air & Space Museum in Washington DC. They are both real LMs, but only LM 9 was built for flight. LM 2 was a test article used by NASA early in the program. 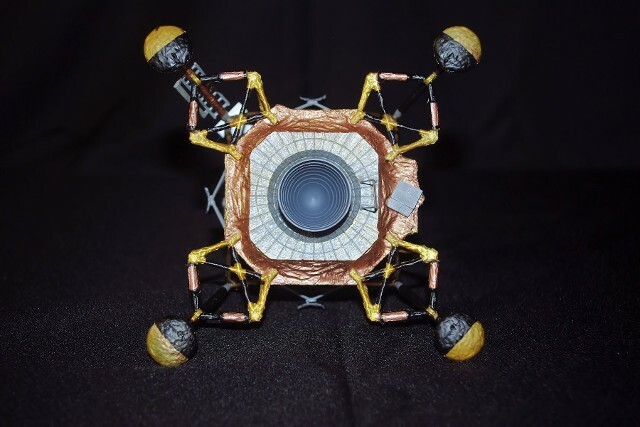 That's why my Dragon LM model was built to replicate LM 9. A port-side view. The Dragon model has excellent detail and comes with its Decent Stage already clad in gold-foil color. The silver-gold-copper "Mylar" banding on the landing gear must be painted by hand, as must the edge detail of the Ascent Stage and the exposed fasteners in th black areas of the Ascent Stage. Full-on forward view. The container for the US flag is on the left side of the ladder. The omni antennas are very well detailed. Starboard side forward. The decals used were a combination of the SMS 1/48 scale LM super detail set and those provided by Dragon. The windows are black-faced decals, probably the biggest disappointment in Dragon's crafting of the model. The vent covers and other details came from New Ware's 1/48 scale LM Detail Set. Starboard-side, aft. The bulge for the Decent Stage's helium tank was molded in, as were all of the foil-like surface textures. Overhead, port side. 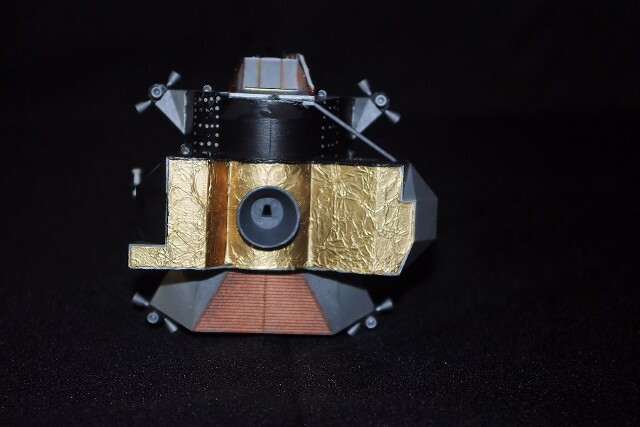 The docking target provided by Dragon was incorrectly molded, so I replaced it with a scratch-made version, using the SMS decals. Underside view, showing the excellent detail in the Decent Stage, engine bell and gear struts provided by Dragon. The underside of the Ascent Stage, showing the detail provided by Dragon. As mentioned, the front windows, so far, are the only serious issue with this model. 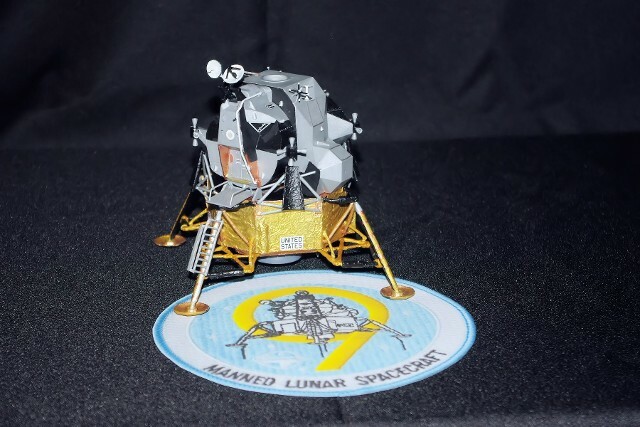 The LM 9 model with her official Grumman patch design. 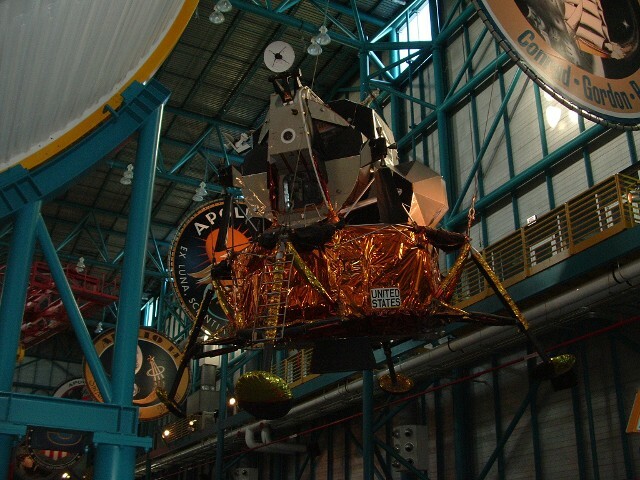 Below, LM 9, on display at the Apollo-Saturn V Center. Here's to the last of her kind. She stands today to inspire and remind us of what we can do when we dare to be bold.